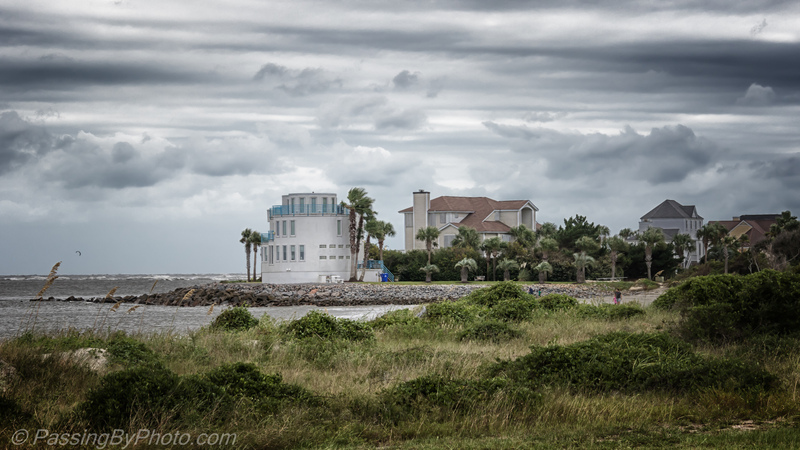 Perched near the end of Sullivan’s Island, SC, overlooking Breach Inlet, these homes had a ring side seat as the sky and water reacted to approaching Hurricane Irma. Taken 9/9/2017 — two days before Irma hit Charleston as a Tropical Storm with a storm surge higher than experienced last October during Hurricane Matthew. I really like this photo – it has a very special quality to it! Quite surreal really! Thanks, Liz! It felt surreal that day, knowing a big storm was coming and waiting to see which way it was going to dodge. Been there many times and it’s beautiful rain or shine! Great shot. Thanks, Gina! It is beautiful and we went back two days after Irma and I regret that I didn’t take another photo from the same spot to document the change to the shore line from the storm. Excellent shot Ellen. One can feel the suspense of the approaching storm.